Staying in a city or town close to London can really save you a bundle and you don't even have to deny yourself the big city fun. A lot of people have mixed feelings about visiting a world class city like London. They'd love to see that special show, sports event, royal pageant, Lord Mayor's Show and fireworks over the Thames. And they'd love to peek inside some of the most famous stores in the world. But they believe it's too expensive. Maybe, they worry, the big event they want to see - for real instead of on television - will make London overcrowded and even more expensive. The good news is that you don't have to choose between London and someplace else with more reasonable prices and uncrowded surroundings. London is ringed with towns and small cities that have attractions of their own and that are gateways to wonderful regional touring - yet are close enough to London to dip into the urban excitement now and then. And all these places are full of less expensive, quieter places to stay and dine. Base your vacation or getaway in Oxford or Cambridge, for example, and you're close enough to pop into London, by train or bus for a show, some shopping or sightseeing. Buy your tickets ahead of time and the tickets usually cost a fraction of standard fare. These are six of my favorite places to stay close to London, but you can find lots more. Simply draw a circle on a map with a 60 mile radius of London. That's pretty much within the commuter belt. Then check National Rail Enquiries or Traveline to find the quickest public transportation route into town. National Rail Enquiries will even help you find the cheapest fare and show you how to buy a ticket online. One of Britain's top 20 destinations for students and other visitors, Cambridge is close enough to London for several day trips yet located in the heart of excellent touring country. As a jumping off place to visit Ely with its beautiful, soaring cathedral - one of the tallest in England - often called the ship of the Fens. To visit the Medieval Hanseatic League town of King's Lynn and the wonderful beaches of the North Norfolk and Lincolnshire coasts. Trains to Kings Cross are scheduled half hourly through the day and take 56 minutes. Trains to Liverpool Street Station take just over an hour. Best advance off-peak day return in 2017 is £14 when purchased as two one-way tickets. Oxford is a great university town with its own unique vibe and the oldest university in the English speaking world. To explore Oxford's haunted castle, build nearly a thousand years ago by the Normans it was a Victorian prison and now part of it has been converted into a luxury hotel. To walk in the steps of fictional television detective Inspector Morse (you can even pop into his favorite pub. To enter the worlds of Harry Potter and Alice in Wonderland at Christchurch College. The college's great hall was virtually the exact model for Hogwarts. And for easy access to the Cotswolds, Blenheim Palace and westward to Shakespeare country. The Oxford Tube is a popular bus service that runs every 10 to 20 minutes, 24 hours a day, with drop off points at several different London locations and wifi onboard to pass the time. Round trip is about £16 for adults, with student and senior tickets as well as multi trip tickets. The trip takes about an hour and 15 minutes, depending upon traffic. Amersham, on the Northwestern edge of London in Buckinghamshire, was the setting for one of Britain's most famous romantic comedies, Four Weddings and a Funeral and the home of one of children's literature's most famous bears. To drink,dine or stay at one of several traditional coaching inns. The Crown, was the setting of the first wedding in Four Weddings and a Funeral. It received a TripAdvisor certificate of excellence in 2017. To visit the one-time home of Christopher Robin, A.A, Milne's son and friend of Winnie the Pooh. To check out the churchyard and see if you can find the grave of Ruth Ellis, the last woman hanged in Britain. To amble into Royal country with Windsor and Ascot, as well as the scandalous Cliveden not far away. To dine at Artichoke, a great little foodie magnet and award-winning restaurant that, inexplicably, is still waiting for more than passing attention from Michelin. To see its ancient Market Cross and visit one of England's oldest Charter Fairs, held annually on the 19th and 20th of September under a charter signed by King John I - the same wicked King John who was forced to sign the Magna Carta and who made Robin Hood's life such a misery. Amersham is on the end of the Metropolitan and City Line - the oldest line on the London Underground, which is the oldest Underground system in the world. The journey takes about an hour an a half. A quicker option is rail to Marylebone Station, which takes 40 minutes. Check National Rail Enquiries for train times, prices and links to buy tickets. 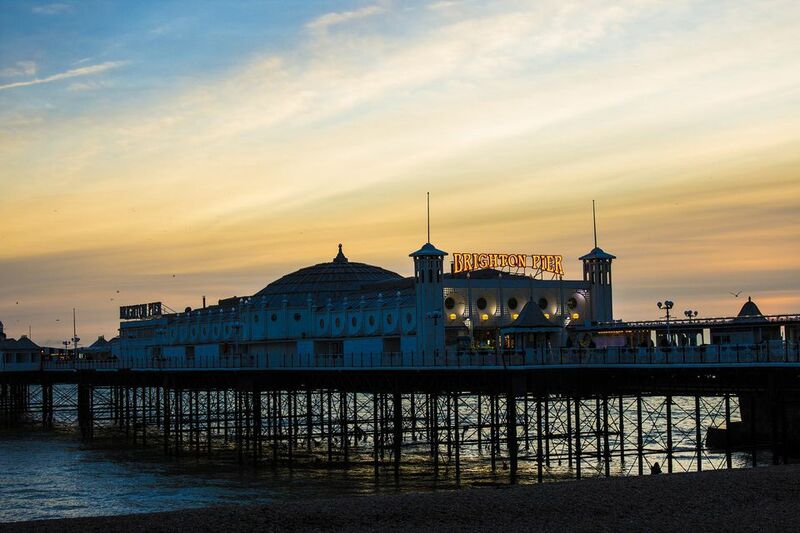 Brighton is often called London's Beach but it's a town with a strong personality all its own. If you like edgy, urban places by the beach you will love it. To visit the Royal Pavilion , the most exotic summer cottage in the world. To walk about a quarter of a mile out to sea on Brighton Pier, munching fish and chips in the sea breezes. To look down on the backs of flying birds and to see Brighton and a big chunk of the South Coast from 450 feet in Brighton's newest attraction, the BA i360. And, if you must leave Brighton, hike the South Downs National Park and visit the white cliffs known as the Seven Sisters. Trains to London Victoria or London Bridge Station leave Brighton about every 15 minutes. The trip takes just under an hour. The first time you set eyes on Arundel you will wonder why you haven't seen it, or even heard of it before. To put it plainly, this town is simply gorgeous and packed with history. To visit Arundel Castle. Built by the Dukes of Norfolk and the Howard family, it dates from 1067 but was massively reconstructed into a turreted fairytale fantasy in the 19th century. It towers over forests that tumble down into a charming town. One of its owners lost his head on the block after providing King Henry VIII with two of his nieces for wives. They were Anne Boleyn and Catherine Howard and they lost their heads too. To see one of England's most impressive Catholic cathedrals, oddly designed by the man who invented the Hansom Cab. To birdwatch at the Wildfowl and Wetlands Trust Center (in the summer, excursion boats on the River Arun leave from the town center to explore it.). To sunbathe on Climping Beach near Littlehampton, one of the South Coast's most pleasant, small beaches. Arundel is a gateway to much of the South Coast, including seaside resorts, Seven Sisters and Beachy Head. The Cathedral city of Chichester, with its theater, and the Goodwood Estate where both horse and motorcar racing as well as vintage car and air events take place, are easy to reach too. Direct trains leave regularly from Victoria Station and take about an hour and a half or less. The clapboard houses of Whitstable, with their climbing roses and faded shutters will remind you of New England. It's quaint, relaxing and close to Canterbury as well as London. Oysters! This is the English capital of oysters. Natives come into season in the cold months but Rock Oysters are farmed and available year round. An easy side trip to Canterbury. This salty little town on the Kent coast is actually part of Canterbury and there's a good cycling route, The Crab and Winkle Way along an abandoned railway path to Chaucer's Cathedral City. There's Michelin-starred cuisine at the Sportsman Pub in nearby Seasalter. Trains to Victoria leave Whitstable regularly. The trip takes about an hour and a half and the cheapest fare is about £20.